This ASME training course includes section VIII Div.1 (Rules for Construction of Pressure Vessels), IX (Welding Qualification) and V (Nondestructive Examination) and is a video training. This is 40 Hours (5 days) course and available online all over the world. This course also is a perfect course for individuals who want to learn about pressure vessel inspection and testing. When you completed the video training sessions for VIII Div.1 (Rules for Construction of Pressure Vessels), IX (Welding Qualification) and V (Nondestructive Examination), which cumulatively is almost 20 hours, in the next step, you will be connected to the practice exam portal with hundreds of practice exam questions; you need to complete them. 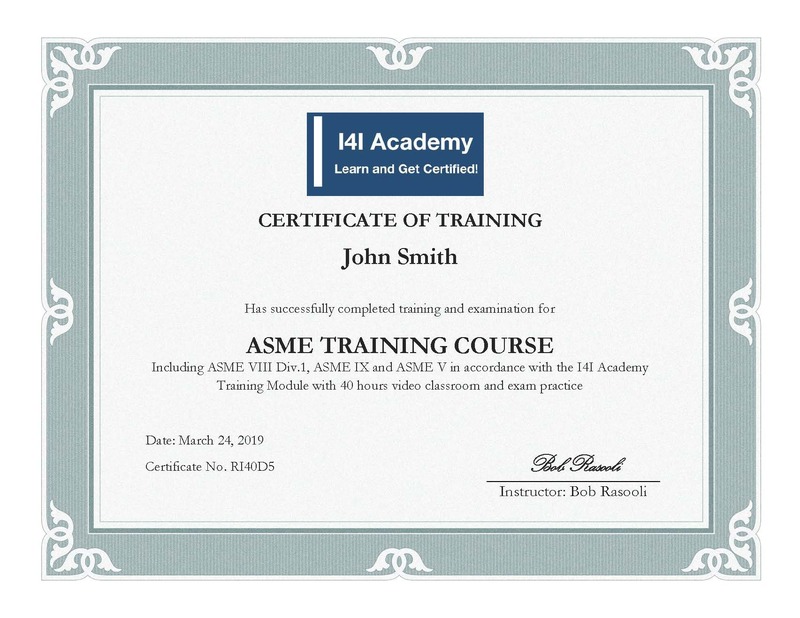 There are almost 300 questions about section VIII Div.1, 170 questions about section IX and 165 questions about section V.
You are going to take a final exam (150 questions - Open Book) at the end of the ASME Training Course and receive a certificate from I4I Academy with my signature. Risk-Free: You can return this training course up to 48 hours from the time of enrollement.